After Lauryn Hill kept silent during a court appearance in her tax evasion case this week, the singer posted a note on Tumblr last night saying she's signed a new record deal and explaining some of her side of the story in what she called a "10+ year battle, for a long time played out behind closed doors." Hill said she has teamed with Sony to launch a new label on which to release new music. "And yes, I am working on new music," she wrote. She described her new deal as one "that better reflects my true contribution as an artist and (purportedly) gives me the control necessary to create a paradigm suitable for my needs." Hill continued, "I have been working toward this for a long time, not just because of my current legal situation, but because I am an artist, I love to create and I need the proper platform to do so." Hill last year pleaded guilty to evading taxes on $1.8 million in income between 2005 and 2007. She had promised to make restitution of about $554,000 before a sentencing hearing held earlier this week, when a federal judge heard she had only paid about $50,000. The court gave Hill an additional two weeks to pay the rest. 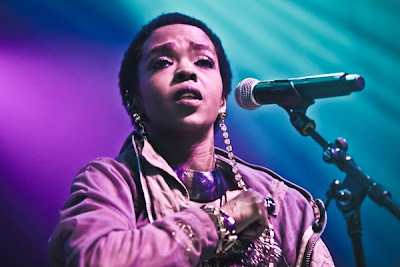 The former Fugees singer released her lone solo studio album, The Miseducation of Lauryn Hill, in 1998, followed by an MTV Unplugged entry in 2002. She wrote that she has seen only a fraction of the earnings from what she claimed were worldwide sales of 50 million units. "Only a completely complicated set of traps, manipulations and inequitable business arrangements could put someone who has accomplished the things that I have, financially in need of anything," she wrote. It's not the first time Hill has opened up online about her legal and business woes. Last year, she wrote online that she felt her "potential to work" was in danger. "I did whatever needed to be done in order to insulate my family from the climate of hostility, false entitlement, manipulation, racial prejudice, sexism and ageism that I was surrounded by," she wrote.